One of the best things about owning a vacation home or rental cabin is the sense of community that comes with it. Often located in beautiful scenic areas, these tiny homes offer an alternative for those who want to escape for the weekend. 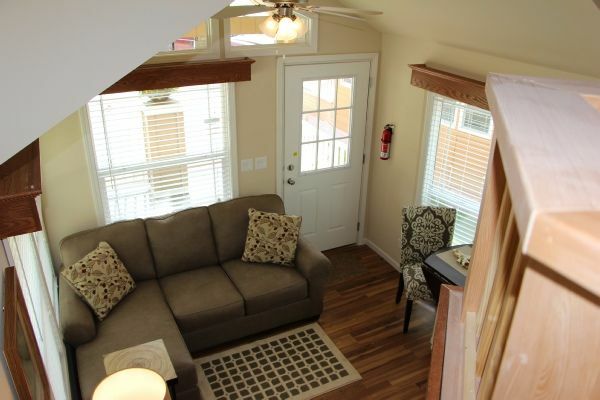 On classical RV resort sites, the park model series are becoming more and more popular – with a homely feel, they make great little getaway retreats at reasonable prices. 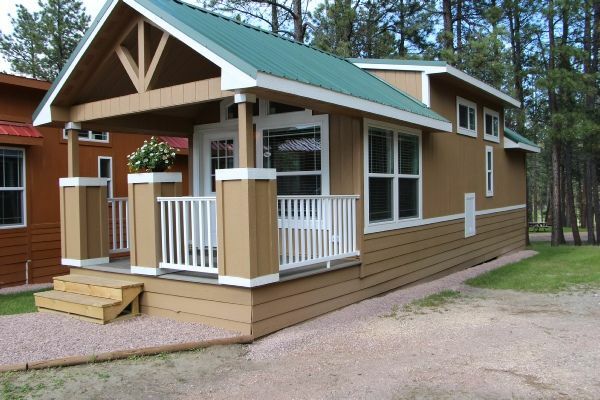 Royal Series Model 239 by Horse Creek Resort is tucked into the scenic Black Hills of South Dakota within a small residential resort of RVs and traditional park models. The open-plan design and large upper loft space makes this pretty vacation home seem much more spacious than its 399 square feet. Should we take a closer look? Some park models can be quite boxy in design, but not the Royal Series 239. 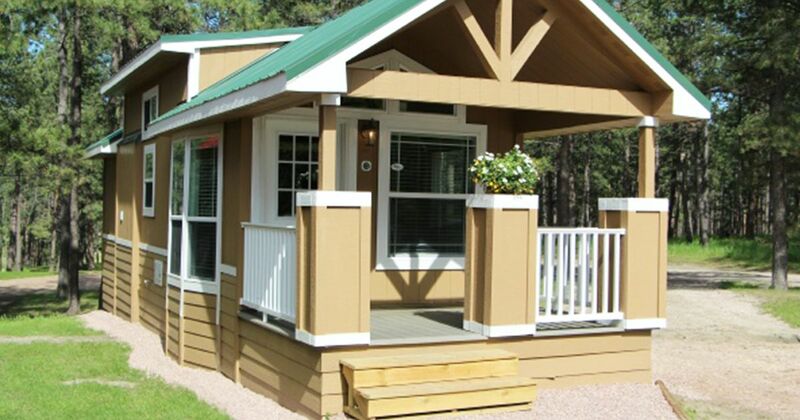 With a strong exterior structure, we love the pretty features included in the exterior, inviting you in. Plenty of windows to let in the light, there is even a beautiful bay window in the living/dining area – a great place from which to take in the views. Stepping into this tiny park model from the porch, we enter directly into a bright living, dining and kitchen area. The fact it is all open plan creates the impression of a much larger space than it actually is – the large windows really contributing to this, too. Beautifully decorated in simple colors, this simple living room has more than enough space for a good-sized L-shaped sofa, which is a great relaxing spot in the evening. 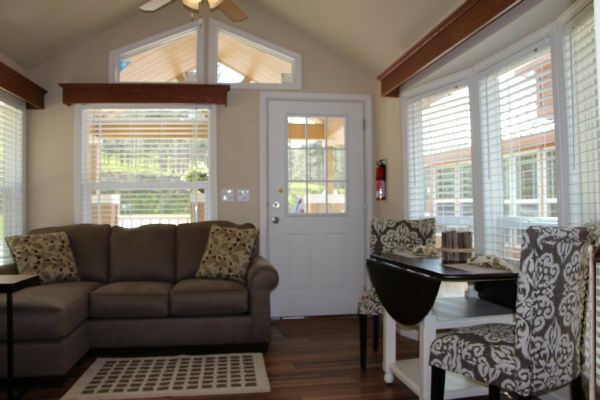 Can you imagine opening up the front door to the porch, warm air blowing through while you take an afternoon nap? Albeit small, a fold-down round table sits perfectly into the high bay window with ample space for two. Having guests over? There’s always the possibility of opening the table up. A crucial part of the design of a good park model is the effective use of space and, as we will see throughout this tour, the Royal Series 239 is an excellent example of how to do this well. We adore a beautiful wooden finish in any house, and the stunning medium-dark laminate flooring in this tiny home matches perfectly with the other fixtures and fittings. Look how all available cupboard space has been utilized with lovely 5-piece wood cabinet doors. 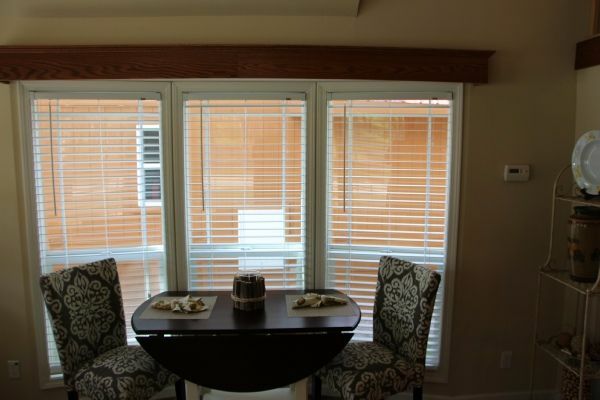 All large windows throughout the house are also covered with high-quality white blinds for privacy. 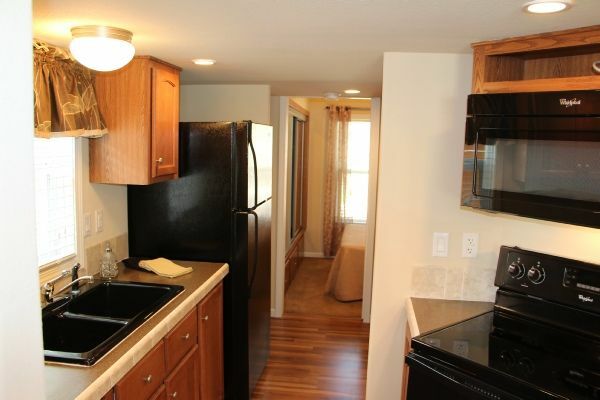 This kitchen has everything a small family needs while away. 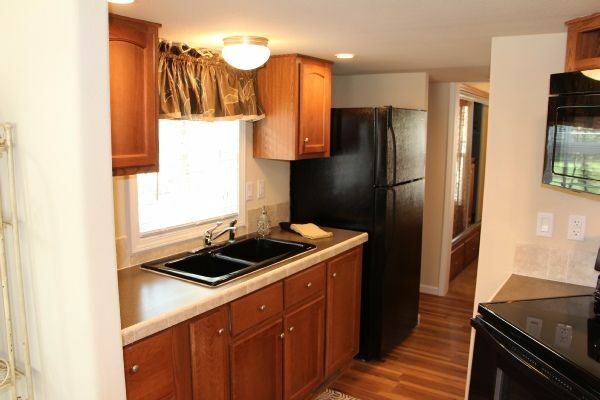 Compact, yet complete – there is a huge fridge/freezer, cooker, built-in microwave and double sink. Plenty of storage cupboards line both the upper and lower walls of the kitchen, leaving lots of preparation space on the high-pressure laminate countertops with ceramic edging. 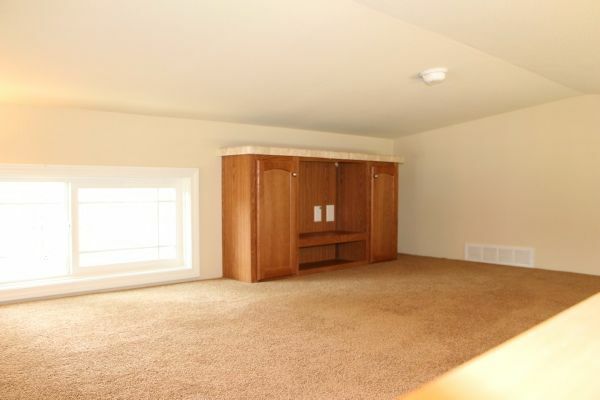 Also on the ground floor of this special park model is the only bedroom in the home. We can’t imagine a more welcoming rest spot after long walks in the surrounding hills. Clean, simple and lightly decorated in neutral colors, this small bedroom does cozy at its best. 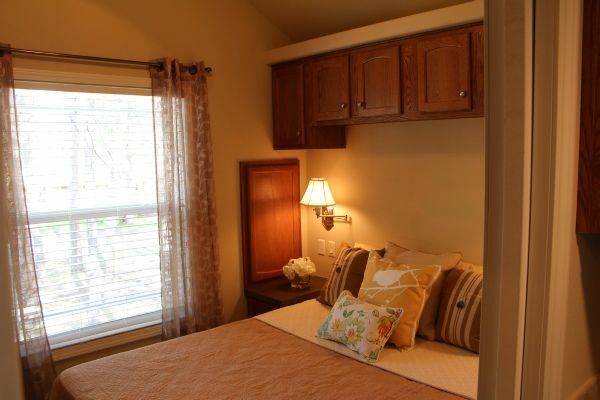 Have you noticed the overhead cabinets above the large double bed? Storage is really not a problem in this incredible vacation home. 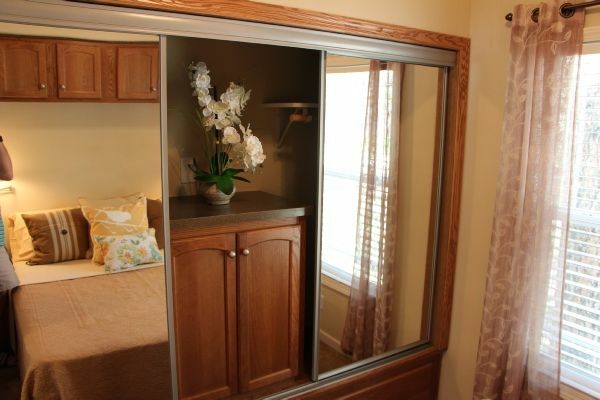 We can’t move on in the tour from the bedroom without showing you the incredible built-in closet space available. The fully-fronted mirrored sliding doors really open the room up, and the large closet provides owners or guests with both hanging and drawer space for belongings and clothes – so innovative! Within the typical vaulted ceiling of the open-plan living room sits a large loft space. 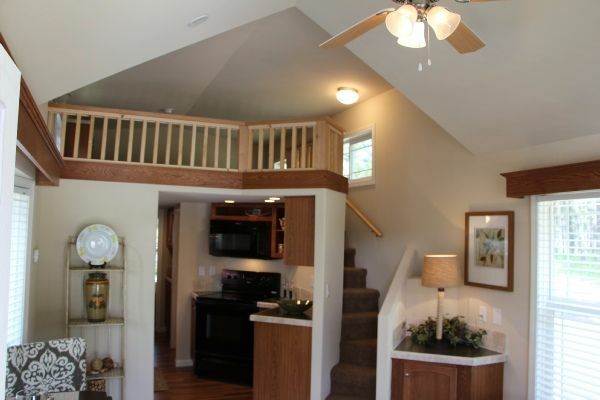 The overhead balcony provides a lovely view of the room below while still giving upstairs guests some privacy. The staircase and balcony are built in the same light wood seen throughout and the light neutral carpet brings warmth to this upper level of the property. 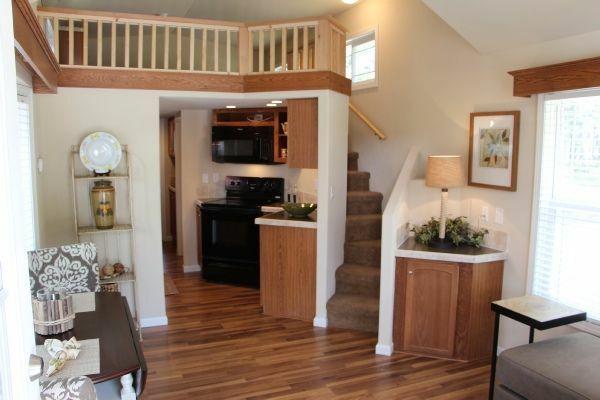 What a wonderful extra space to have in a vacation home! 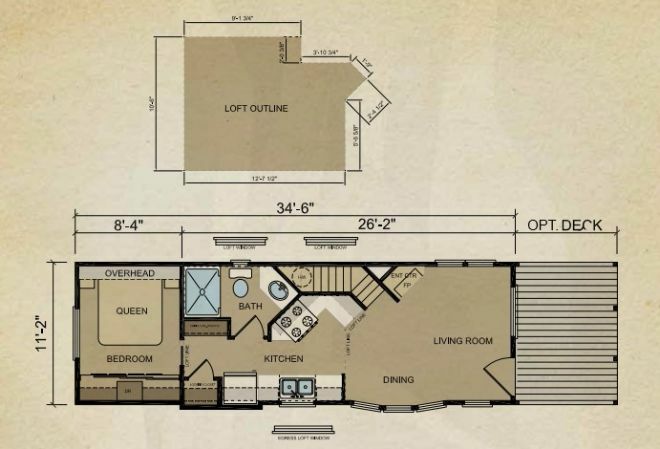 Unlike some park models, this loft space is easy to move about in as the ceilings do not feel too low. There is also a good amount of built-in cupboard space up here – perfect for guests. The wide front porch gives this stunning little park model a traditional country feel and is more than spacious enough for a garden table and chairs for outdoor eating. The fact it’s sheltered from the elements is an added advantage, so you can enjoy this beautiful, decked space all year round. 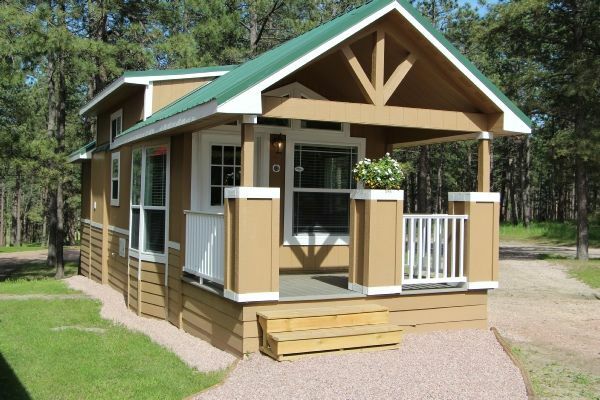 If you could see yourself vacationing in this tiny house, LIKE and SHARE on Facebook!